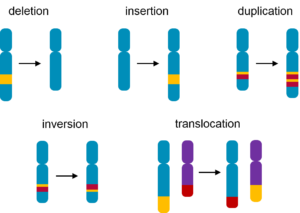 Structural variation accounts for most of the base pairs that differ between two human genomes and causes many genetic disorders. The ability to study structural variants, in addition to smaller single nucleotide variants and indels, is critical to understanding how genetic variation impacts health and disease in the era of Precision Medicine. Variation between two human genomes, by number of base pairs impacted – Single nucleotide variants (SNVs); insertions and deletions (indels) involve fewer than 50 base pairs; structural variants consist of greater than 50 base pairs. Explore this research further. Whitepaper: Learn how long-read sequencing is enabling detection of the full spectrum of structural variants to advance the study of human disease, evolution, and genetic diversity. Fast and simple whole genome sequencing (WGS) library preparation from a low DNA input amount completed in a single tube in around 3.5 hours. Sequel Chemistry 3.0 and the Sequel System provide low-fold WGS coverage of a human genome in 1-2 days, maximizing speed and minimizing cost to increase variant discovery power. Sensitively characterize structural variation (SV) and indels of all types ranging in size from tens to thousands of base pairs in an efficient, full-solution workflow using analytical software tools. Explore our project calculator for structural variant discovery and receive an estimate on the time and materials needed for PacBio sequencing using the Sequel System. To learn more about how SMRT Sequencing resolves structural variation, contact us.